Amir Khan continues his comeback against Samuel Vargas in a WBA welterweight eliminator in Birmingham on Saturday as he targets a world title fight by the end of the year. Khan beat Phil Lo Greco in 39 seconds on a devastating return to the ring at Liverpool’s Echo Arena in April. It had been two years since Khan last fought, when he was brutally knocked out by Saul ‘Canelo’ Alvarez, but he made up for lost time by swiftly seeing off Canadian Lo Greco with a first-round knockout. Khan displayed no ring rust following his hiatus and showed the hand speed which once won him a world title had also not slowed. 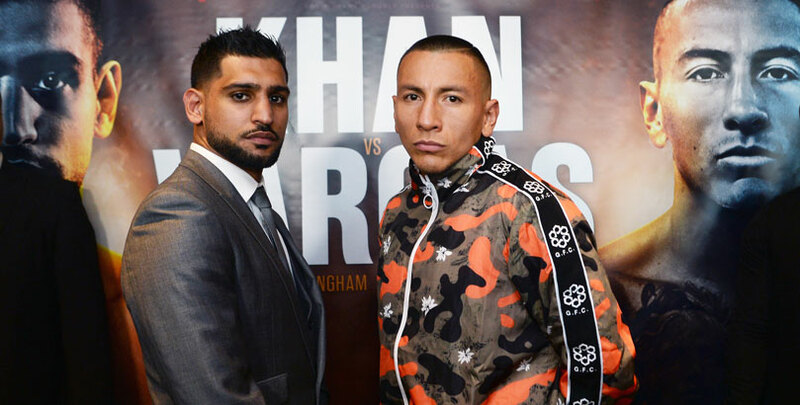 A former unified world champion, Khan is now looking to see off the challenge of Vargas before a potential bout with Manny Pacquiao or Kell Brook. The 31-year-old said: “We’re getting closer to a world title fight, which is where I want to get to. Vargas, a 29-year-old welterweight based in Toronto, has a record of 29 wins – 14 by KO – three losses and two draws. Two of Vargas’ defeats have come on the only times he’s stepped up in class – against Garcia, who previously beat Khan, and Errol Spence. It took Garcia seven rounds two years ago so on that basis, plus the relative inactivity of Khan, we like 33/50 for the fight to last less than nine rounds. Vargas was supremely confident at Thursday’s press conference, insisting Khan is now past his best and damaged by the devastating knockout defeat against Alvarez. He said: “There’s no doubt in my mind I will be victorious on Saturday night, whether it’s by knockout, going the distance or I break his ribs – I don’t care. “I think he’s an old man and has been damaged a lot. If I touch him he’s going to get hurt. He added: “I hope he does come looking for the knockout as it’ll make for an exciting fight. Whatever he brings to the table we will have answers for. Khan will want to put some more rounds in the bag following his lightning stoppage of Lo Greco so this could go into the middle rounds with 7/1 it takes him seven rounds to get the job done our next prediction. We think the Colombian can be quite durable so 3/1 for the Briton to win on points rounds off our Khan vs Vargas betting predictions.